The 2008–09 economic recession, our country’s worst since the Great Depression, did not impact all Americans equally. While unemployment for the nation peaked at 10.1 percent, it was considerably higher for specific demographics. For instance, adults with less than a high school diploma had a 15 percent unemployment rate, and teenage unemployment rose above 27 percent. Across the board, those who were less skilled or less experienced suffered substantially higher rates of unemployment and spent longer periods of time searching for a job than their more-educated counterparts. This unfortunate employment gap isn’t surprising. Data from the Bureau of Labor Statistics consistently show that a lack of education is a setback in the job market and strongly correlates with lower median arnings and higher unemployment rates. 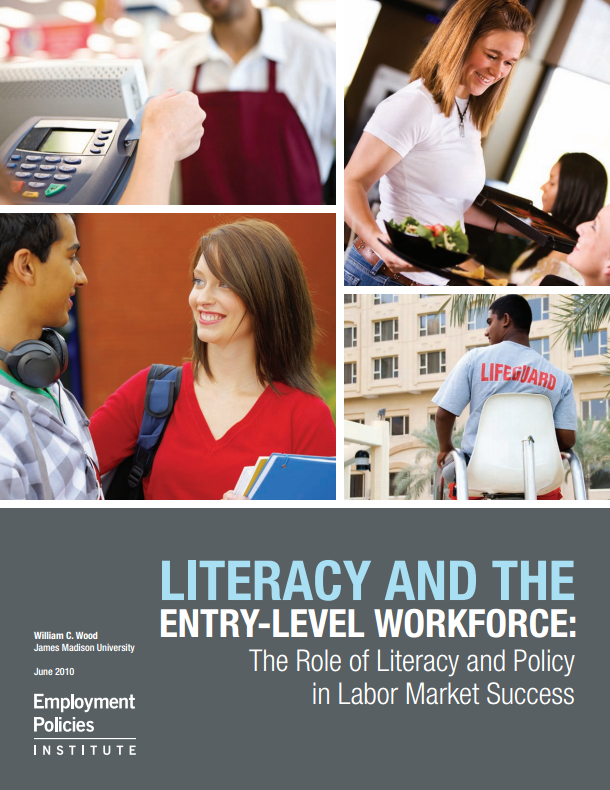 New research from economist William C. Wood explores the important role that literacy and policy play in the employment gap between more- and less-educated Americans. Using data from the National Assessment of Adult Literacy (NAAL), Wood finds that low literacy is associated with a variety of unfavorable labor market outcomes. One striking fact is that those with the lowest literacy scores are 16.5 times more likely to have received public financial aid in the past year, relative to those in the highest literacy group. They are also more likely to be in the lowest measured wage group, working full-time but earning less than $300 per week. Even controlling for education and other personal characteristics, those who have difficulty working with and filling out forms (e.g., job applications) are at a higher risk for being low-wage employees. Less literate individuals are coming to the workforce with other disadvantages: Wood finds that nearly 64 percent have never used a computer, and only 27 percent have a high school degree or equivalent. Those with a high school diploma or higher are 2 to 4 percent more likely to be employed full-time than their less educated counterparts. For these less-educated Americans, the workplace can function as a second classroom—a chance to gain valuable experience needed to move up in the workforce. But instead of making potential employees more attractive to employers, the most popular labor policies unintentionally make less-skilled employees more expensive to hire. Wood classifies these pay and benefit mandates as employer push policies. Governments at the city, state, and federal level frequently use such policies in the form of a mandated minimum wage. Wood’s research demonstrates that these policies can actually be a barrier to work if an individual’s skill set can’t justify the higher pay. If a small grocery store owner is required to pay a minimum wage of $8 or $9 per hour to hire someone to stock shelves, he or she is far less likely to take a chance on training an applicant who can’t read the food labels or use a computer to log their work. Instead of providing opportunity to a less-skilled individual, mandated wages or benefits can take that opportunity away. With roughly 27 million Americans lacking the basic ability to fill out a job application, the results of this study have important legislative implications: Well-intentioned policies that mandate more costly terms of employment—like increases in the minimum wage—may have perverse results that end up harming their intended beneficiaries.